First Impression: This deck is turning more and more beautiful, I love examining/seeing the different cultures being interpreted in one deck. This deck, or the majors at least, are also turning out to be very astrological. I feel the need to study more about astrology but I don’t know where to begin, and it is a very complex thing. She is not the traditional way of interpreting 12th card. I love it. It’s another way of looking at the same card. Symbols*: The web is a matrix of all life. Our actions have a karmic effect and can affect other lives in far-reaching ways. The stars help to illuminate our progress as we contribute our own unique threads to the ever-changing design. The spider is the Great Mother, our teacher, guide, and the weaver of destiny. A feather signifies her ability to expose truth despite our possible resistance to acknowledging it. The circular motif reminds us that life is continuous and ever-evolving. Changes are inevitable. Description*: The Spider Woman’s influence expanded throughout native tribes and could be found among the Navaho, Pueblo, and Hopi peoples of the Southwest. In an Anasazi-Pueblo myth, Spider Woman was creator and goddess of the people. She spun her thread in four directions: north, south, east, and west. Thus she created direction out of a primordial void. She fabricated the sun and moon using earth elements. She then placed it in the vast sky and illuminated the darkness surrounding the moon by scattering stars in the cosmos. From there she made all manner of living things. She then created woman and man and blessed them with thte power to consider her web of wisdom. From the first humans grew an entire race of people, each one inheriting the web of wisdom. But soon the people became disillusioned and forgot about the gift of insight, so Spider Woman transferred them to the second world. In the second world, evil overwhelmed the sensibilites of the people and they were forced to make an exodus to the third world. With Spider Woman as their divine teacher, they learned how to plant, make fire, and weave. But over time they ignored the web of wisdom and anarchy began to surface. Spider Woman intervened and instructed the wise members of the people to set upon a journey to the fourth world. Here they would learn to start over. With the help of a squirrel, a reed was planted so that those willing to leave evil behind could make the journey to the fourth world using the growing plant as a ladder. The people who transferred to the fourth world learned language and prayer and finally remembered to reflect upon the web of wisdom. But, alas, somehow evil also ascended to the fourth world, so the Spirit of Death flourished, making the people mortal and human. Possible Meanings: The web of life may need to be repaired if neglect and imbalance begin to permeate its delicate threads. 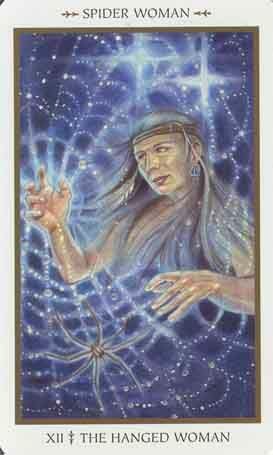 Spider Woman reminds us to take a look at our current situations and make sure that we do not lose sight of our journey, otherwise we may become lost, entangled in an uninspired state of being. Senses: She is creating the spider web with her mind. She knows how to manipulate things, both in good way and bad way. I am scared of spiders, but this small spider with its long legs somehow seems sweet. I get the sense of wanting to be more creative around it. I get inspired by both of them. This card is a very powerful card. Thoughts/Points to Ponder: I feel the connection to the spider. I have to go to my “Messages from your animal spirit guides” oracle cards to see the meaning of spider. Spiders are associated with creativity, wisdom, weaving, balance, storytelling, writing, connectedness, inspiration, feminity, nurturing, communication, imagination, individuality. “The pulse of creativity is especially strong right now, triggering a not unfamiliar and compelling desire to express yourself through creative writing. Whether or not the tales you weave are true, whether they’re based on actual experience or the imaginings of your fertile mind, each day sit yourself down and pour out the words that come to you. Don’t ponder each sentence or paragraph; just write whatever wants to be written through you. To inspire and enlighten others, you don’t need a profoundly complex tale. Start by describing a personal experience, one where you gained some insight that may also be useful for others. However, don’t focus on how people wukk respond to your story; instead, just enjoy the process of writing without judging your work or yourself. Write to express – not to impress. Personal notes: So the reason why I saw three spiders within a week, one bigger than the other, on the white carpet while I was doing readings. I was truly inspired, my creativity shone. Even though at that moment, I didn’t see the connection between the three spiders, I see them now. I feel a strong connection to this card, stronger than I initially thought I would.